These days, it seems like everyone has a different take on the tried-and-true funnel-style approach to lead generation. Some marketers are talking about flipping the funnel. During a presentation on contextual engagement at the Forrester event, GoDaddy CMO Phil Bienert used the term to describe hundreds of unique buying journeys for specific, highly segmented prospects. The idea came about when the company realized many of its small and mid-sized business users had vastly different interests: Some wanted information and products to help scale their business; some were content simply to maintain the status quo. In a separate B2B-focused presentation at the event, Forrester VP and Principal Analyst Lori Wizdo suggested re-thinking the funnel model altogether. Rather than inverted pyramid, think funnel cake. Why is the traditional funnel facing so much scrutiny? Thanks to the advent of digital marketing and social media, B2B buyers are interacting with brands through multiple channels throughout the sales process. In fact, more than 10 channels influence buyers at each stage of the journey, Wizdo noted in her presentation. That means B2B marketers should shift their focus away from campaigns that simply hand leads to sales. It promotes a numbers game theory of sales and marketing.Marketers tend to think the more leads you put into the top of the funnel, the more deals that will come out. However, there’s a danger in overemphasizing volume at the top of the funnel, because in practice, the funnel is not a high-performance engine, Wizdo said. “When we recently surveyed B2B marketers about the conversion ratios in their lead funnels, respondents on average cited an end-to-end conversion ratio of 0.75% — less than 1%,” she said. In other words, it’s not about what buyers can do for you; it’s about what you can do for buyers. It’s not a unique concept in the B2B marketing world, but what’s new is it’s being applied at all stages of the sales process. (Dare I say funnel?) Thanks to today’s proliferation of data, marketers can identify prospects and deliver highly relevant content at first touch. Plus, marketers can pinpoint the prospects that are most likely to actually complete a purchase. This in turn allows them to “better allocate market spending and sales efforts on audiences that best match these patterns,” Wizdo noted. In other words, the approach can potentially save big bucks. 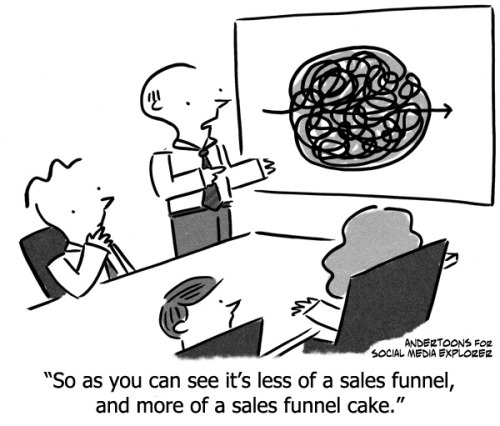 It’s not quite as tasty a term as funnel cake, but it may be a pretty accurate description of today’s marketing and sales cycle. What do you think? Are you a fan of the funnel? How would you describe today’s buying journey? Let us know below.